William was David’s grandmothers brother. He was Pte. # 200662 of the 4/1st Battalion Cameron Highlanders. He died at Mazinghein in France on 25/10/1918. 4th Btn Cameron Highlanders disbanded. William Scales transferred to 1st Btn Cameron Highlanders. Probably sent back to Loos to join 1st Division. Attack on Double Crassier, Loos. Moved to Ypres for final stages of 3rd Ypres (aka Passchendaele 31 July – 6 November). Remained in the salient through the winter. 17th – 25th October Battle of the Selle. 23nd – 26th October Billeted in Mazinghien (Field Map reference R.33.b) during time in Support Line. God knows where the map is. Total casualties for October (1st Cameron Highlanders) 10 Officers and 196 other ranks, one of which was Uncle William Scales. 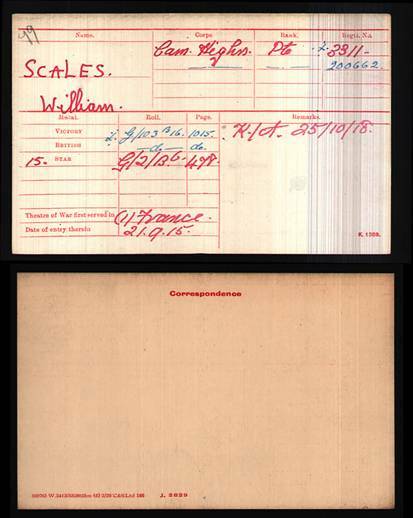 William Scales was first buried in Mazinghien and later laid to rest in the Highland Cemetary, Le Cateau.